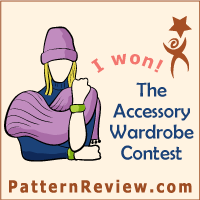 I have had this pattern for a while and I just love the dress in the pattern photo. I finally decided to make it in this navy, printed poly fabric with a nice drape (or so I thought). There is a lot of work in this pattern, which I always enjoy, but the final result has left me decidedly underwhelmed. The front hemline is shorter than the back, which is fine, but I think it's perhaps too short on me at the front making the proportions look wrong. The side view is not doing me any favours around the midsection. The back view is ok, but I think the gathers at the front and the back are too high up and would look better at the waistline. The blue piping, which I agonised over, is all wrong. It highlights the area between the waist and the bust, instead of drawing the eye somewhere more interesting. 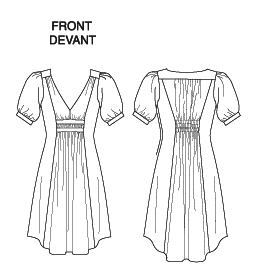 The front of the dress has a very interesting gathered section with piping, that is extremely difficult to sew neatly. This squiffiness was my best effort! If I made this again I don't know that I would add the piping, both for the look and for the ease of obtaining a neat finish. The gathered section does provide a nice fit at the bust and yes, the neckline is very low! The more I analyse this dress, the more I realise that the focus is very much in the bust department. The back gathers are quite nice I suppose. I'm not sure where I stand on the sleeves, but I suspect there is something a bit wrong there too. I'll accept that this dress is not a total disaster, but I don't feel inclined to wear it. It looks kind of bulky and the proportions are off. I am still dreaming of one that looks like the pattern picture, so I'm not ready to abandon this pattern yet. - investigate lowering the gathered sections, but may require too many pattern alterations. - wear in the winter with tights, boots and a big coat over the top. In spite of it's faults, this is a lovely dress and seems to fit beautifully. You should wear it! If you can find the ideal fabric you mentioned, you should try again. I'm sure all the extra effort would be worth it! Yes, the fit is very good. Yay for a redeeming feature! I've made this pattern before and been underwhelmed by the result. It's always such a shame when it's taken a long time to make. I've just looked at your version and it's lovely. Well done having the forethought to slim the sleeves. I love it in the plain black. Beautiful work, as always, but its just not you! I think the model on the pattern cover has about a foot on all of us AND has high heels on. So basically anything would look good on her! Some length on your dress would probably help.... I'd be inclined to cut it straight and add a really heavily ruffled border to give it weight and putt it down on you. Or not. What do I know? Gosh a ruffle, that's not something I would have thought of doing. I love getting ideas from other sewers! I can see why you were drawn to this pattern, it is extremely elegant and interesting. I can also see why you might be underwhelmed by it, but I think your solution at the end of your post is a good one! Ha. I'll beat it into submission somehow! Well, yes there is that if nothing else!! I liked your analysis (and LOLed at the suggestion to style it with a big coat!). Re sleeves, I have a top with gathered, puffy sleeves, and whenever I wear it, I feel like it is a little twee. The dress already has a lot going on, maybe simplify to sleeker smooth sleeves? I think you are right. Twee sleeves are probably central to the overall problem. They are not really a style that looks good on anyone except a shepherdess! I do like your version but will look forward to seeing your next version with vested interest since I have this pattern. Thanks for the detailed feedback. Oh I think maybe it's your turn to try it and then tell me what to do next time!! I can see your point about the sleeves. How would it look sleeveless? It may change the proportions of the entire dress. Yes, losing the sleeves could make all the difference. I'm wondering about progressively cutting them down until I find a length I like. It's a bit daring after all that work though! Love the basic premise but I agree it just didn't quite work. Definitely lose the contrast piping and I would go for a straight cut all around, whatever length you think suits you. I think there are very few women the high-low hem looks flattering on. I would also go for a sleek 3/4 length sleeve. The ones on the pattern look much longer and smoother than they actually turned out to be. You could definitely fix the hem and the sleeves without too much trouble and I think you'd be much better pleased with it. Such a shame you are not loving this dress after all the hard work you have obviously put into it. I love the neckline. There are lots of suggestions for how you could make it work. Definitely worth a bit of tweaking. This is one of those patterns I always meant to hunt down someday (Sew Very Prarie made a shortened version; how I miss that blog). And now you're reminded me. I hope you make this again. The basic shape I think suits you (how could it not, yours is a great shape!) and the back view is just fine. The piping is the only bit I don't like. aww what a shame - i love that fabric and i can imagine it looking great with that pattern. but you are right, the blue pattern is a little distracting. bummers! I think it is a style thing. Nice dress but it isn't you - too baby doll.